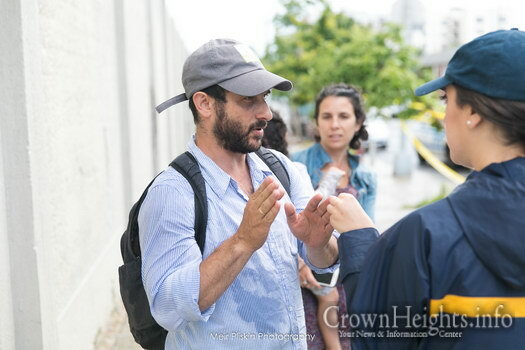 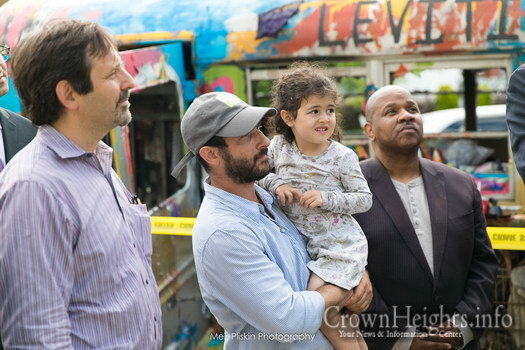 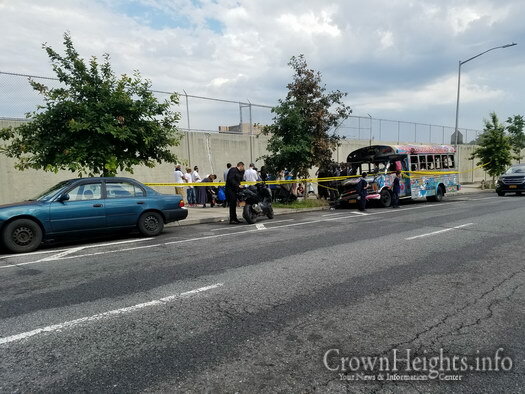 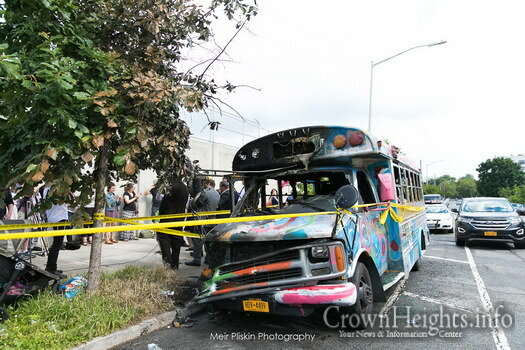 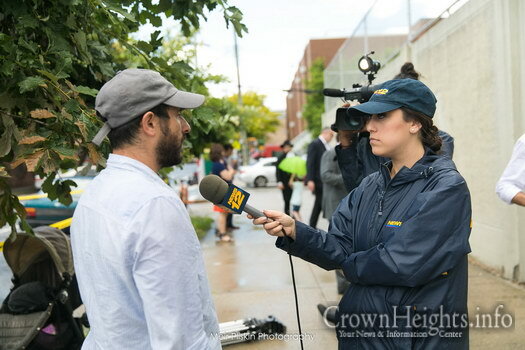 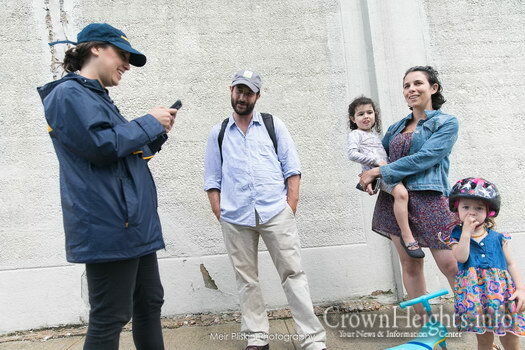 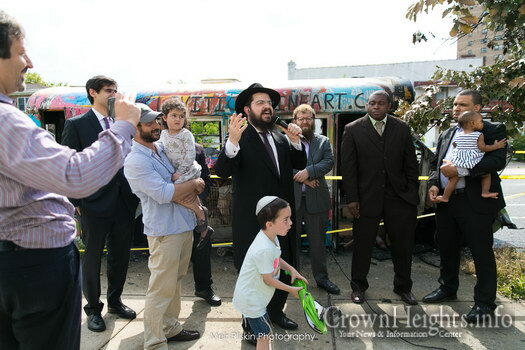 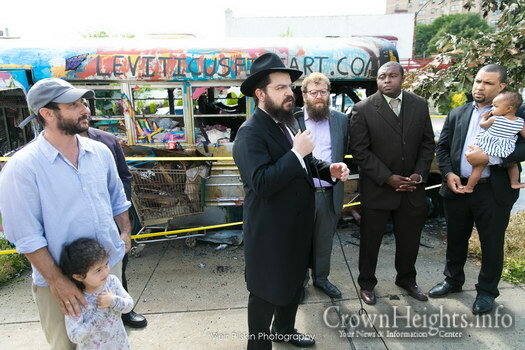 A handful of community members and activists gathered on Troy Avenue at the site where a Jewish artists “Art Bus” was torched in an incident which police are investigating as a possible hate crime. 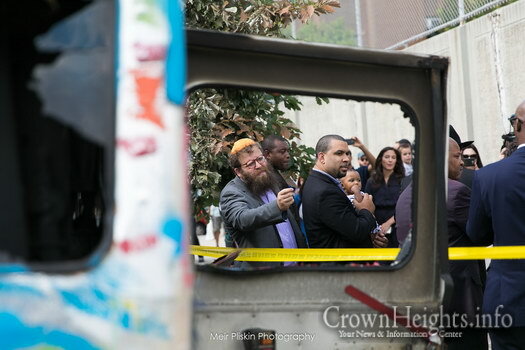 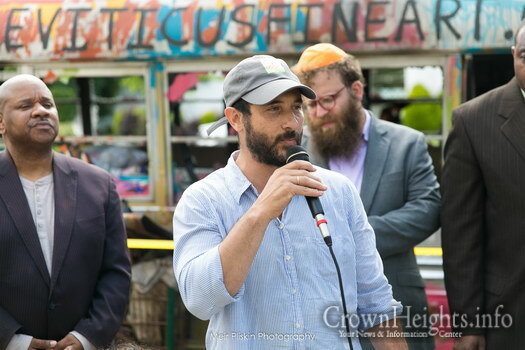 Singer Benny Friedman was on hand and performed his hit song, which was filmed using the bus. 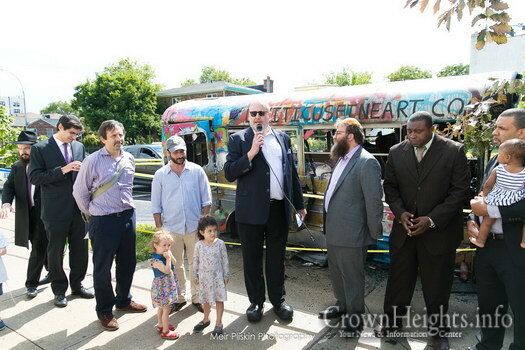 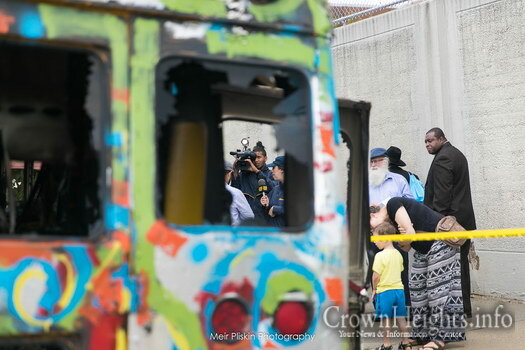 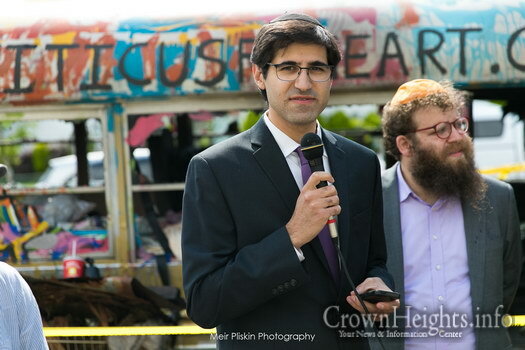 A few dozen residents and activists gathered on Troy Avenue and Maple Street at 3:30 Tuesday afternoon to “Rally Against Hate”, at the site were an art bus – dubbed the Mitzvah Bus – was torched on Sunday night. 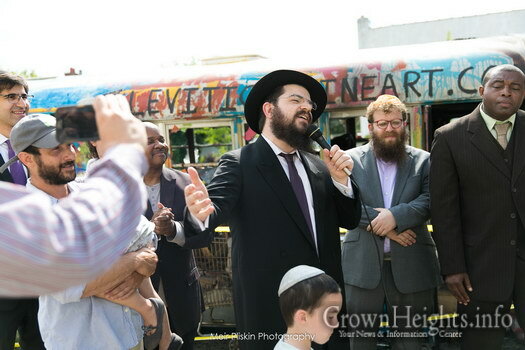 Benny Friedman himself was on hand and performed the hit song in front of the gathered crowd. 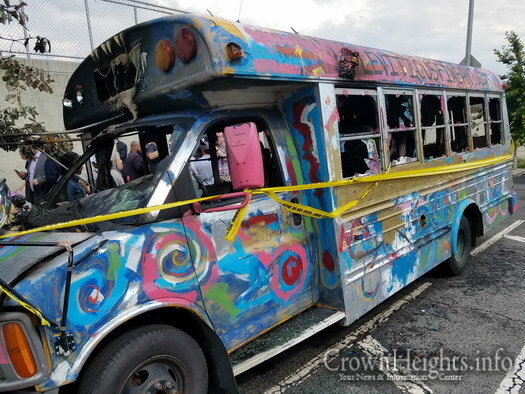 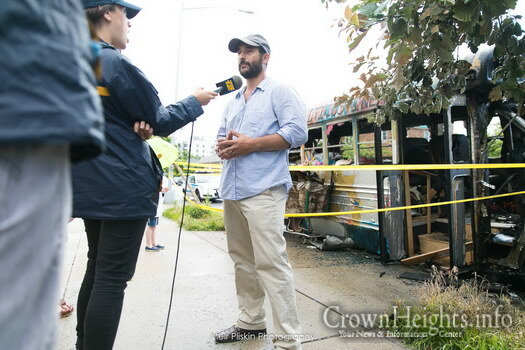 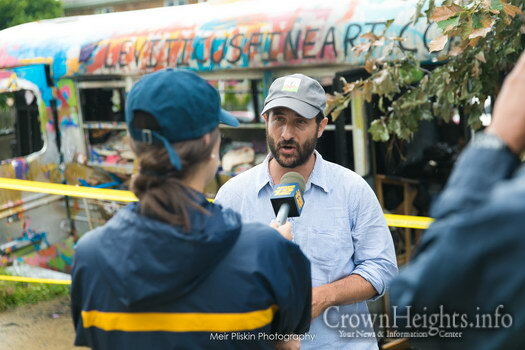 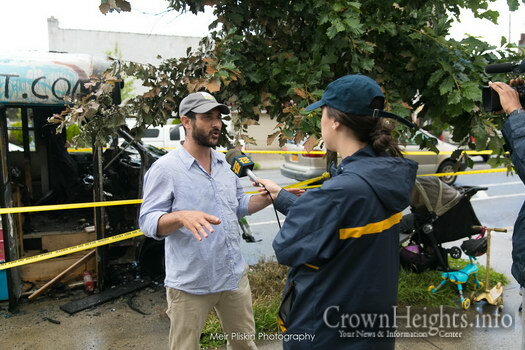 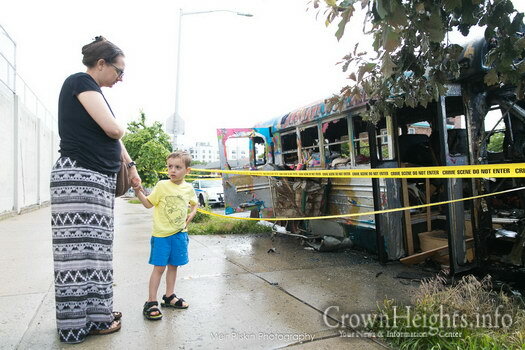 Owner and artist Leviticus Schieber described the events after discovering his bus was torched “I was pretty shocked,” he said, adding that he then went about his business and tried to figure out what to do next. 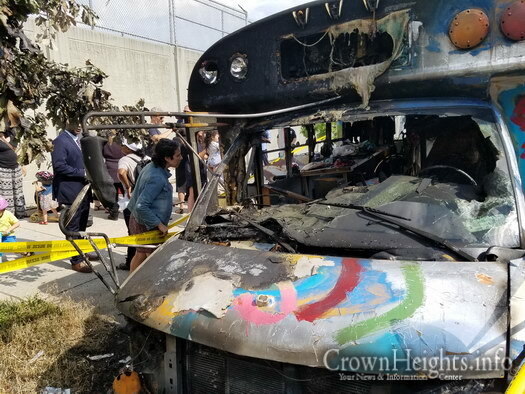 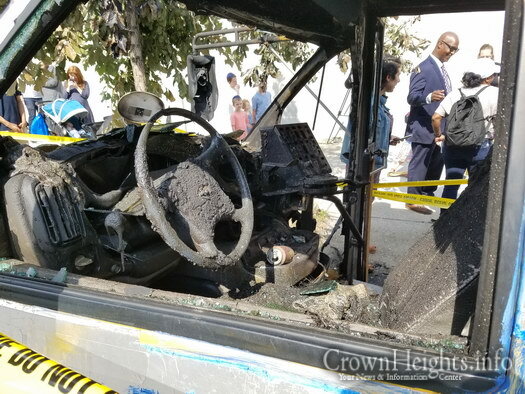 Initially the fire was believed to have been caused by an electrical short, but surveillance video later revealed that a man was seen next to the bus when the fire broke out. 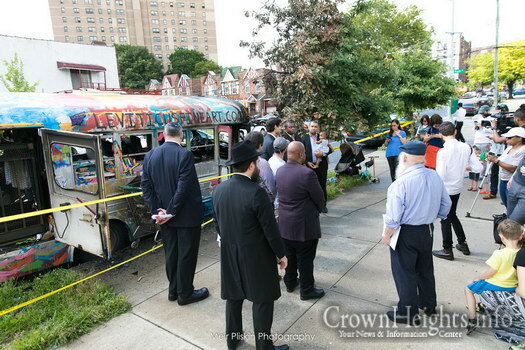 Police are considering the incident a possible hate crime. 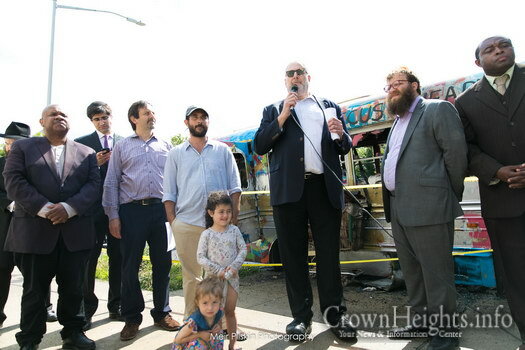 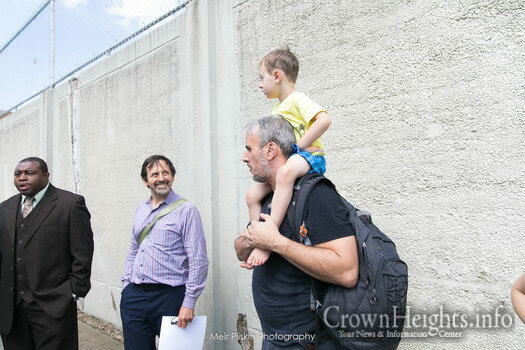 The gathering was organized by community activist Yaakov Behrman, along with Sruly Meyer and Avram Zamist. 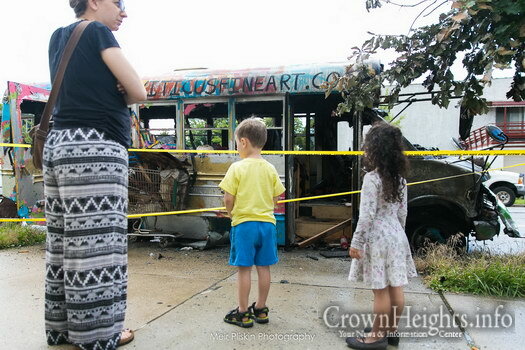 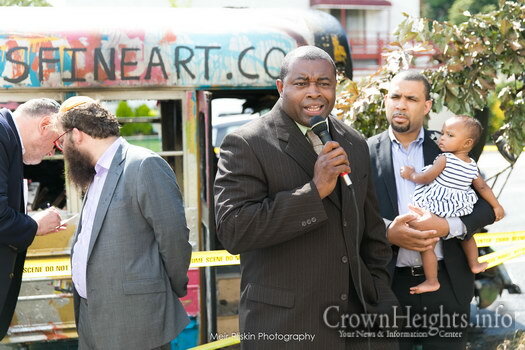 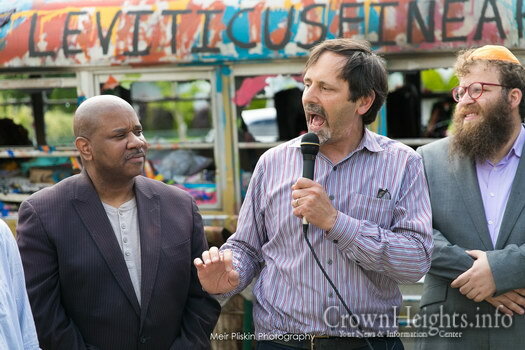 Comments Disabled To "Community Unites Around Torched Art Bus"
Have we no shame?? 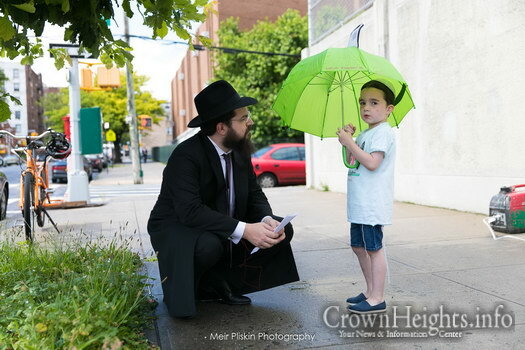 On Gimmel Tammuz? 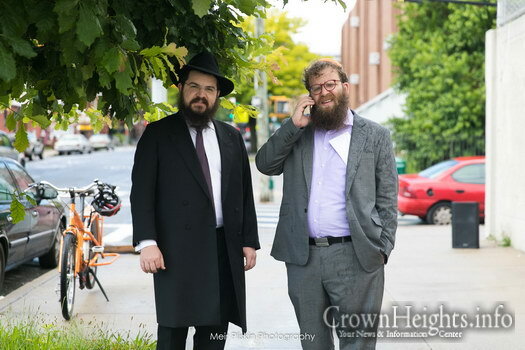 מזינגט און טאנצ’ט אויפן גאס אויף די טאג?! 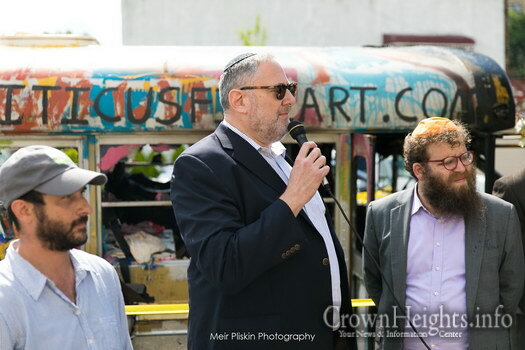 That’s because it was organized by POLITICIANS. 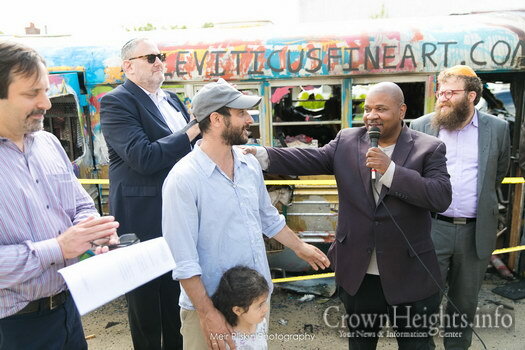 I hate to say this, but the above gathering was a photo op for the politicians, not a true outpouring of neighborhood support of the artist nor a true protest over the way the horrible incident is being handled. 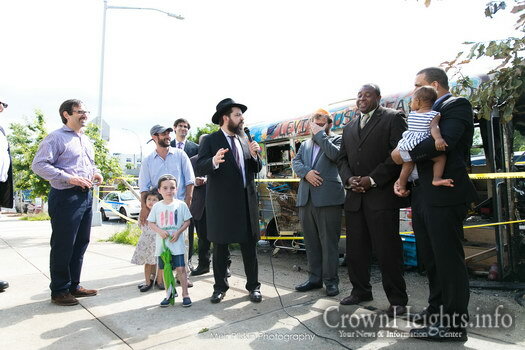 When there are as many or more politicians in attendance as there are “community,” and when there are THIS MANY photos, please forgive me for pointing this out, but this is politicians, and their staffs, making hay out of the situation. 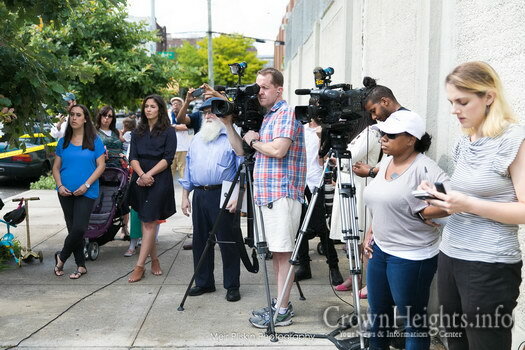 Our “community activists” should be doing outreach to OUR COMMUNITY MEMBERS, not to politicians, to show up to gatherings like this. 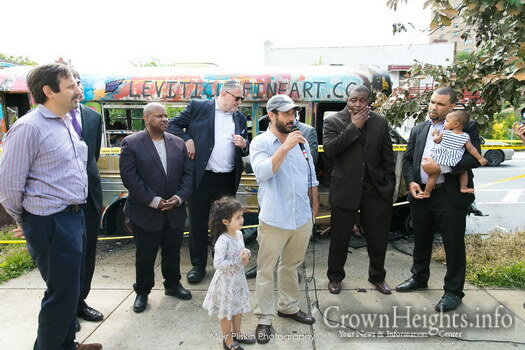 I didn’t hear about this gathering until after the fact, on this website, even though I have a phone, email, etc. 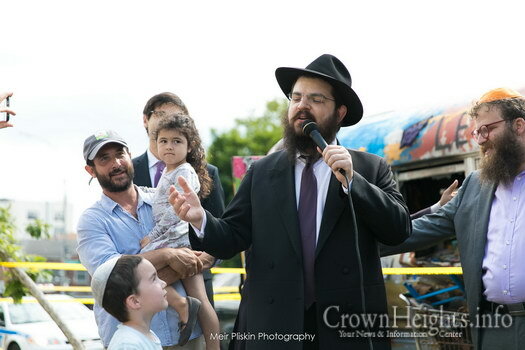 In contrast, the community turned out by the thousands for the gathering on the evening of Gimmel Tamuz, baruch Hashem. 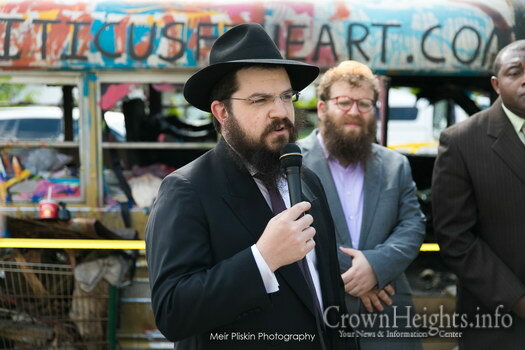 The Gimmel Tamuz event was not organized by politicians, and it was not a political “photo op”. 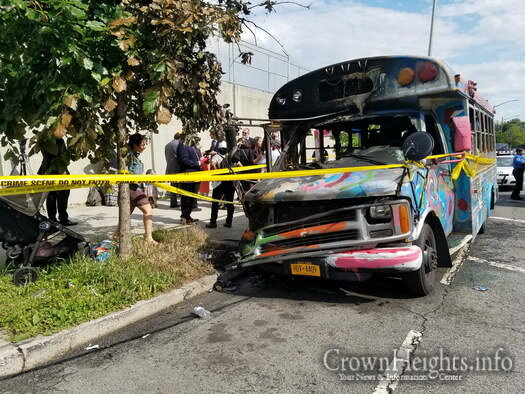 THIS is where we are united–not to the exclusion of the bus owner who of course deserves attention to what happened, as well. 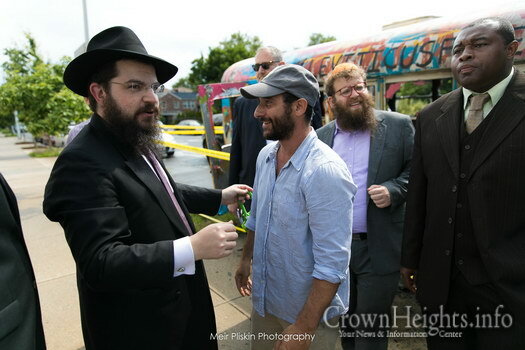 Sorry, I agree with Yakele. 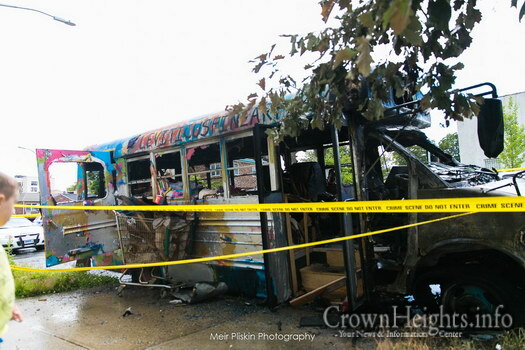 This should be a warning as to the need for surveillance cameras in this dark and isolated area. 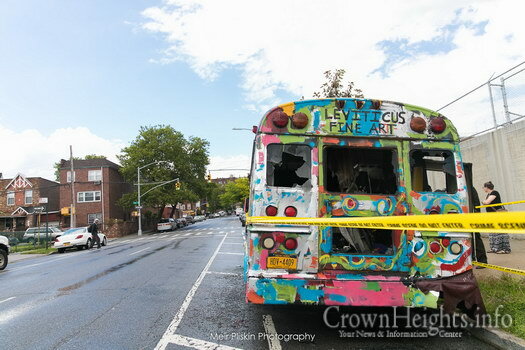 Although property was damaged, thank G-d it wasn’t a person who was harmed. 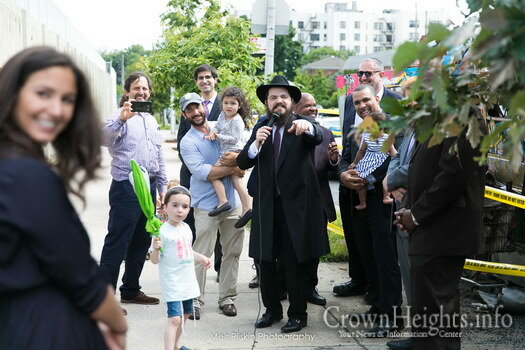 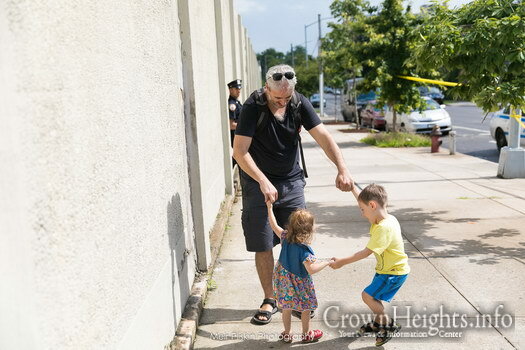 About a year ago, several non-political Jews stood up at a Community Board 9 meeting and asked for surveillance cameras in this specific area. 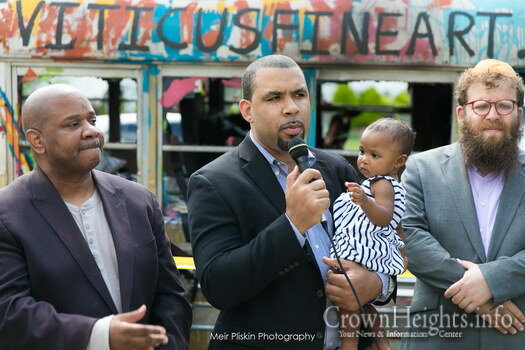 In response, City Council persons Cumbo & Meally said they would donate money from their budgets. 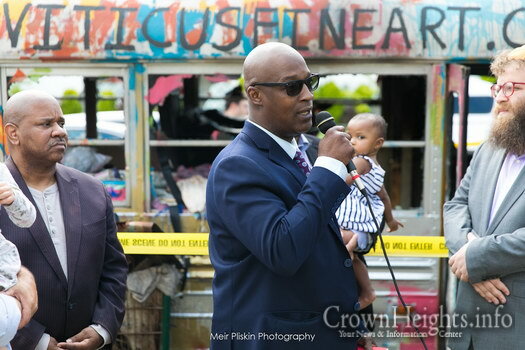 However, your government funded local leaders have done nothing but bring more drug addicts and homeless to the neighborhood, all under the cover of supportive housing. 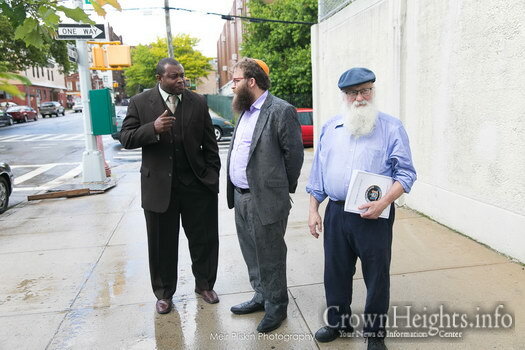 You need more cops walking the streets and more surveillance cameras to cope with the homeless dumping and crime in East Flatbush.